Finland's Snowek Introduces Trombia Sweeper Attachment to U.S.
European sweeper manufacturer Snowek Ltd., based in Finland, launched its North American expansion officially at the National Pavement Expo 2019. At the Nashville show the company presented its flagship innovation, the waterless Trombia sweeper attachment, a machine that makes it possible for municipalities and contractors to use available front end loaders for full-scale city and industrial sweeping of dust and debris. Trombia sweepers are PM2.5/PM10 certified in Europe to the highest, 4-star, rating within the most advanced self-propelled vacuum sweeper category. 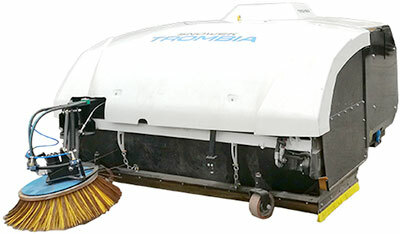 The Trombia sweeper offers a true water-free environmental alternative to the marketplace. "We started with demos and presenting the product in Upstate New York and New England last summer," said Antti Nikkanen, Managing Director of Trombia sweepers. "Following the great feedback and subsequent demand, the National Pavement Expo 2019 in Nashville served as the official marketing launch of the Trombia sweepers in the US. The launch also matches well with the new OSHA regulations on worksite silica dust control now in place. We are seeking to open new committed dealerships during the year across North America." Inside Trombia's sweeping chamber the sweeping process is fully waterless, which enables contractors to clean and sweep with higher accuracy and perfection in the sweeping result. 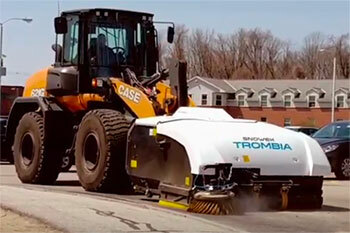 For pavement contractors, Trombia delivers a one-pass solution by leaving a dry surface that is ready to pave. Says Nikkanen, "Trombia delivers excellent sweeping performance in both fine dust and heavy debris. Plus, when Trombia finishes sweeping the pavement surface remains dry. There is very little downtime, since the Trombia has no filters to clean and, since the Trombia is operated via the loader's hydraulic system, there are also no conveyor belts or auxiliary engines to maintain. "There are many key value propositions for using Trombia. In the end they all add up to deliver an excellent return on investment for both the sweeper and for the wheel loader that, with a Trombia sweeper, may be utilized for serious road maintenance work year-round." You may also see the Trombia sweeper March 28th and 29th, 2019 at the National Heavy Equipment Show 2019, in Mississauga, Ontario, Canada. Trombia Sweepers will be at booth 4310.